Soon you will be able to auto backup and sync your whole computer on Google Drive. By the end of this month, Google will launch Backup and Sync — a new, simple tool that has been designed to help you backup not only your documents and photos in the cloud but your entire computer as well. Data loss is always the worst thing that can happen to anyone, so having backups of all your data is always a good idea. Also, having regular backups can save you and your company in the events of data breaches and ransomware attacks. "On June 28th, 2017, we will launch Backup and Sync from Google, a tool intended to help everyday users back up files and photos from their computers, so they’re safe and accessible from anywhere," reads Google's post on the G Suite Blog. 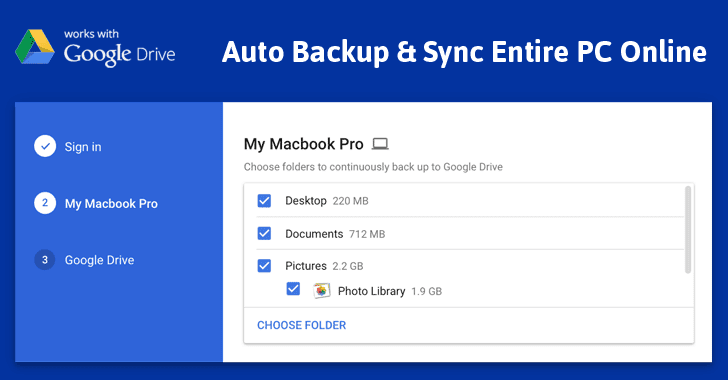 The Backup and Sync tool will replace the current Google Drive uploader client for Mac/PC, and will also be integrated into the desktop Google Photos uploader. So, instead of creating entirely new folders on your system, the tool allows you to select system drives and folders and accordingly will recreate your system in the Drive. Aimed at regular consumers, Backup and Sync is a standalone backup solution that features a simple interface to automatically upload your files to the cloud as they are modified and protect it from undesired events. The new full-system backup tool is useless for free accounts that come with 15GB of storage, but users can get 100GB of storage for $10/month, 10GB of storage for just $2/month, and 10TB for $100 a month. Since Backup and Sync is still in testing phase, the tool will not immediately be available for G Suite Basic, Business, and Enterprise Customers.